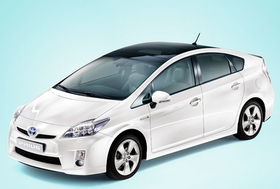 The Prius uses 1kg of neodymium and up to 15kg of lanthanum. LOS ANGELES (Reuters) -- The Toyota Prius hybrid automobile is popular for its fuel efficiency, but its electric motor and battery guzzle rare earth metals, a little-known class of elements found in a wide range of gadgets and consumer goods. Worldwide demand for rare earths, covering 15 entries on the periodic table of elements, is expected to exceed supply by some 40,000 metric tons (8,800 pounds) annually in several years unless major new production sources are developed. One promising U.S. source is a rare earths mine slated to reopen in California by 2012.